A European Commission investigation into whether British plans to use public money to convert a coal power plant into a wood-burning facility broke EU competition law, was opened Thursday (19 February). UK calculations and estimates on the plant’s total production “may be too conservative”, said the Commission, meaning that the British government is giving the project more money than necessary. The Lynemouth Power Station will generate renewable electricity by burning wood pellets. Once adapted to using biomass, it’s expected to produce 2.3 terawatt-hours (TWh) of electricity per year, enough energy to power almost half a million houses annually. The Commission estimates the plant will use more than 1.5 million wood pellets a year. As the EU market will not be able to satisfy demand, the British government will pay to import them from the US and Canada. “Subsidising such a large volume of wood pellets could significantly distort competition in the biomass market,” said the Commission. Member states are obliged to reduce their carbon emissions and increase their energy consumption produced from renewable resources by 2030. Countries with many coal power plants, like the UK and Germany, are converting them to biomass because it will help them hit their renewable targets under the EU 2020 law. Wood is classified as a renewable resource used in power plants to produce electricity. But a coalition of environmental organisations, including the European Environmental Bureau, Transport & Environment and Birdlife Europe, warn that wood reserves are rapidly shrinking. “The growing use of wood for energy will lead to increased logging of forests with potentially serious negative impact on biodiversity,” said Sini Eräjää, EU Bioenergy Policy Officer? at BirdLife Europe and the European Environmental Bureau (EEB). Green campaigners also claim that burning wood to get renewable electricity is inefficient because it not only pollutes more than coal, but also produces less energy due to high levels of water in wood. “A ton of biomass also contains less energy than a ton of coal, so it takes unsustainable amounts of biomass to replace the huge amounts burned in today’s coal power plants,” said Eräjää. With a high demand of wood in Europe, green groups predict the EU will be running out of stock way before 2030. Even if it’s considered a renewable sources, trees take decades to grow and the older they get, the more carbon they store. The Commission has no say in matters of forest related policies at national level. It is up to each member state to cap forest cutting at a sustainable level. “The demand will clearly surpass what European forest can sustainably supply,” said the coalition of green NGOs. The European farmers and European agri-cooperatives (Copa-Cocega) refuted such claims. “There is enough forest resources in Europe for renewable energy and other uses. They are used in an efficient way. There is legislation at both EU and national level to ensure sustainable forest management as well as an EU timber regulation to prevent illegal logging,” said Copa-Cocega. The stock of wood is rising, as “statistics confirm that currently only 60-70% of the annual increment is being cut”, said Copa-Cocega. As the demand grows, member states are turning to wood reserves in the United States. The Department of Agriculture (USDA) welcomed such developments. Over 100 academics backed a US-government study that said an increase in EU demand for biomass “has a positive effect on US forests and forest markets”. “This scenario will lead to a greater increase in tree planting and overall forest cover in the US South than would otherwise be the case,” the USDA concluded. The study was met with criticism from activists and conservation organisations, including the Dogwood Alliance. An appeal signed by over 50,000 Americans sent to the Commission in December, asked the EU to “stop cutting our forests”. 56% of forests in the US are privately owned, and therefore unregulated, making unlimited timber harvesting possible. “The accelerating destruction of our forests is disrupting the critical services forests provide, as well as threatening the quality of life and the long-term economic viability of our coastal communities and existing forest-dependent businesses,” said Adam Macon, Campaign Director at Dogwood Alliance. European NGOs suggest member states use other types of biomass, like residues and waste, to stop forest biodiversity loss. “Conversion of big power plants from coal to wood is not part of a transition to a sustainable energy system,” said Eräjää. Cutting energy consumption, limiting policy incentives, and balancing the demand and supply of biomass will allow a smooth transition to a low-carbon economy, said the green NGOs coalition. “Future energy systems need to rely on efficient and smart use of energy mostly generated from solar, wind and other renewables that don’t emit carbon,” Eräjää explained. 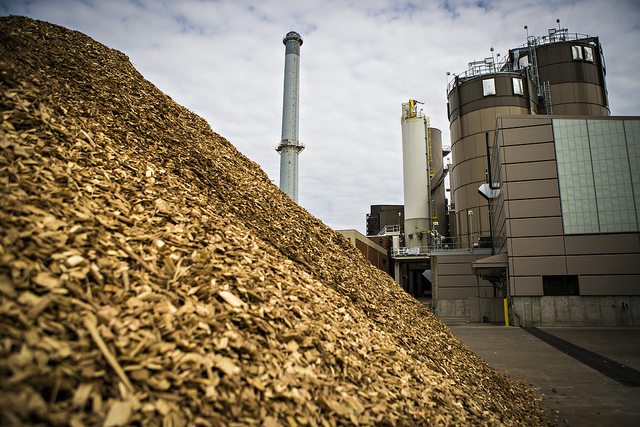 Biomass is derived from organic material such as trees or agricultural and urban waste and is used for heating, electricity generation, and transport fuels. In 2012, biomass and waste accounted for about two-thirds of all renewable energy consumption in the EU. For biomass to be effective at reducing greenhouse gas emissions, it must be produced in a sustainable way. In 2014, the European Commission published a report on the sustainability of solid and gaseous biomass for heat and electricity generation. It has issued non-binding recommendations on sustainability criteria for biomass, which includes: forbiding the use of biomass from land converted from forest, and other high carbon stock areas, as well as highly biodiverse areas. US appeal to European Commission: "Stop cutting our forests"
What does the EU want us to do? Live like Fred Flintstone & Barney Rubble? Energy is something we can’t do without & is a matter for our government to ensure the lights come on & not the EU which should mind its own business & worry about its own energy supplies! These are subsidies as well and the Tax Payers are fed up with perpetually subsidising companies to rectify their current ills. The electricity/energy companies declared huge profits from an already hugely subsidised industry and then get even more subsidies to change their workings. So it is the case all across the UK and the rest of the EU and beyond. It does not mean that it is right. well considering we in the UK have sold our power infrastructure off to the EU and others who are then inturn making a profit.. there should be no public money going to them or the EU. ITS OUR TAXES NOT THE EU’S. we also got sold out to the EU referendum no not later.